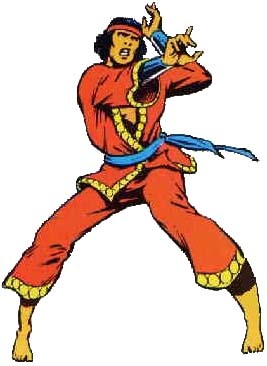 First Appearance: Special Marvel Edition #15 (Dec. 1973): "Shang Chi, Master of Kung Fu!" Daredevil Annual #10 (May 1994): "Vendettas"
The Deadly Hands of Kung Fu #32 (Jan. 1977): "Sons of the Tiger"
Elektra (vol. 1) #9 (Aug. 1997): "Four Strong Winds"
Heroes for Hire (vol. 2) #1 (Oct. 2006): "Taking it to the Streets, Part 1"
Heroes for Hire (vol. 2) #2 (Nov. 2006): "Taking it to the Streets, Part 2"
Heroes for Hire (vol. 2) #3 (Dec. 2006): "Civil Disobedience"
Heroes for Hire (vol. 2) #6 (Mar. 2007): "Guns, Gems, Robots and Terrorists!" Heroes for Hire (vol. 2) #7 (Apr. 2007): "Guns, Gems, Robots and Terrorists! [Part 2]"
Heroes for Hire (vol. 2) #8 (May 2007): "[Guns, Gems, Robots and Terrorists! Part 3]"
Heroes for Hire (vol. 2) #11 (Aug. 2007): "World War Hulk, Part One: Infestation"
Heroes for Hire (vol. 2) #12 (Sep. 2007): "World War Hulk, Part Two: Subjugation"
Heroes for Hire (vol. 2) #13 (Oct. 2007): "World War Hulk, Part Three: Incarceration"
Heroes for Hire (vol. 2) #14 (Nov. 2007): "Procreation"
Heroes for Hire (vol. 2) #15 (Dec. 2007): "Extermination"
Ka-Zar the Savage #34 (Oct. 1984): "Land of the Cancelled Heroes"
Marvel Knights (vol. 1) #1 (July 2000): "The Burrowers"
Marvel Knights (vol. 1) #2 (Aug. 2000): "Thunder Below"
Marvel Knights (vol. 1) #3 (Sep. 2000): "The Destroyers"
Marvel Knights (vol. 1) #4 (Oct. 2000): "Zaran"
Marvel Knights (vol. 1) #15 (Sep. 2001): "The Unreal World"
Marvel Team-Up (vol. 1) #85 (Sep. 1979): "The Woman Who Never Was!" Wisdom #3 (Apr. 2007): "Enter with Dragon"